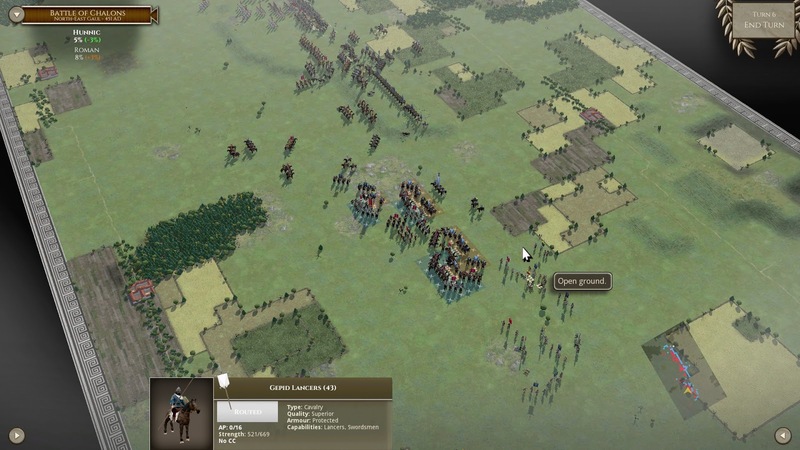 If you haven't been completely oblivious lately, you will know that Slitherine Games has released the best PC game of ancient warfare to date, Field of Glory II. This was followed by its first DLC, Immortal Fire. FOG II has been updated on a regular basis to add even more features and to enhance this already great game. FOG I had a ton of DLCs released, from ancient to medieval warfare. As I mentioned, one of the best things about this game is the fact that it is continually being upgraded, and you do not even have to buy DLCs to get the enhancements to the core game. I do not like one thing about the new DLC, and that is the choice of the 'Epic Battles' that come with it. I am not a sandbox type player that likes to pit X against Y army in different circumstances. 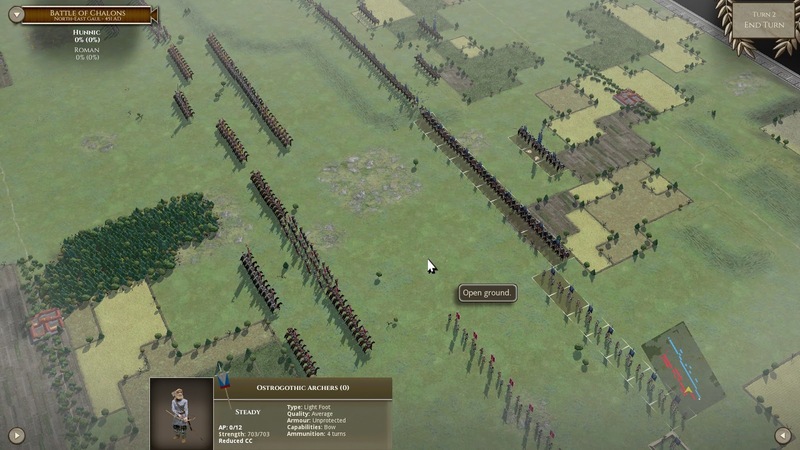 I like to play historical battles. I can deal with plausible 'what if' situations, but that is about it. The choice of battles to include is highly subjective so it is possible that many other gamers will like the included choices. The modding and scenario creating community for FOG II is amazing and very large. So I have no doubt that the battles that I want to re-fight will be along shortly. This is just a taste of the modding done for the game. These mods push the envelope for the game. There are also tons of mods of redone Epic Battles and completely new ones during ancient times. There are also many full campaigns that have been uploaded for ancient times. 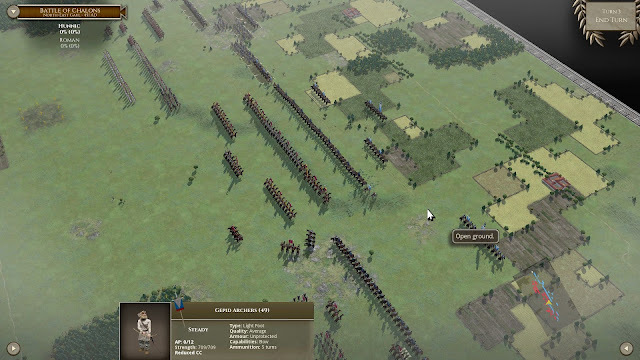 This is an AAR of my replay of the battle of Chalons that comes with the Legions triumphant DLC. The Roman general Aetius has collected what is left of the Western Roman Empire's Army. Added to this are Franks, Alans, and Visigoths to turn back a Hun invasion of Gaul by Attila. Historically the battle was a loss for the Huns, but the winning Allies did not try to destroy the Huns and their allies. So Attila lived to fight another day until dying of a nose bleed, of all things. I am playing the Huns and trying to change history. 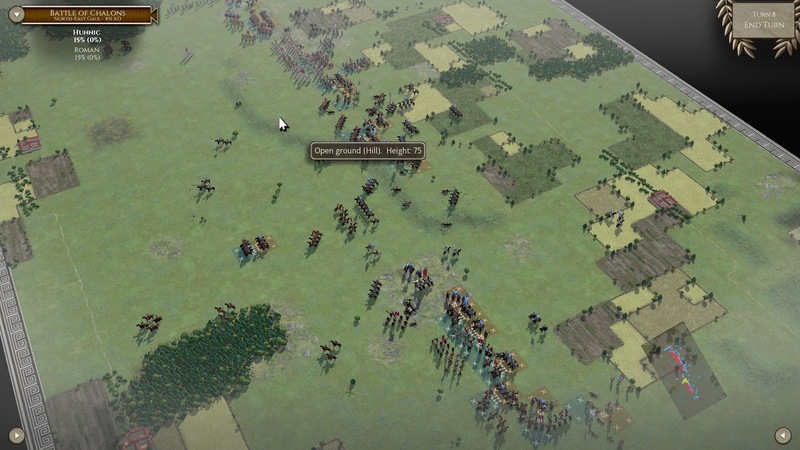 The Huns also have allies in this battle, among them the Ostrogoths, and Gepids. The Hunnish cavalry is the typical horse archer from the steppes of Eurasia, and fought in the same way the older Scythians did, and the Mongols in another 700 years. they will ride close and blot out the sun with arrows until you break formation and try to come to grips with them. Historically they were placed in the center of the Hunnish Army at Chalons. I wonder if a better placement would have been to put them on a flank of the Roman/Allied Army instead. The first two turns are more a a meet and greet between the enemies. I believe I am going to hold back my right from the Roman Army and try to crush their allies in the center and their right. On turn three my Hunnish cavalry has already disrupted some of the Alan units in the center. Unfortunately, my Gepid lancers on my right flank are not nearly a match to the Roman horse there. On my left flank, my Ostrogoths and the enemy's Visigoths seem to be equally matched. On turn four my Hunnish archers are still taking a large toll of the Alans. Turn five is much the same, although I do have my archers on both flanks trying to envelop the enemy. 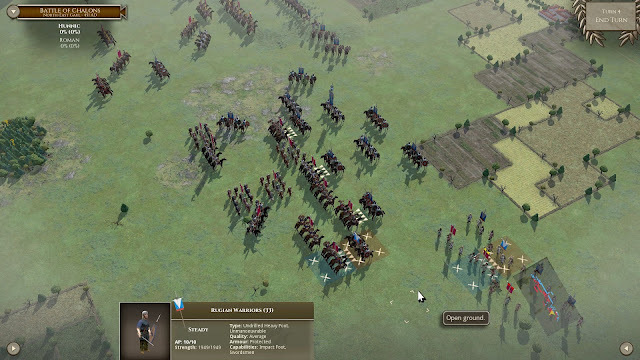 I know that one enemy cavalry charge can disperse my archers to the winds, so I will not really rely on them too much. By turn six, it looks like I am fighting three separate battles. 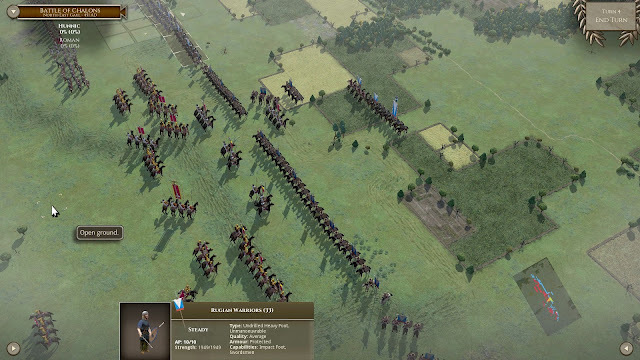 The Huns are decimating the Alans in the center, while the Romans are smashing up my Gepids on my right. The fight on my left could go either way. I have chased off some Visigoths, but my Ostrogoths are taking a beating in the center of the conflict. 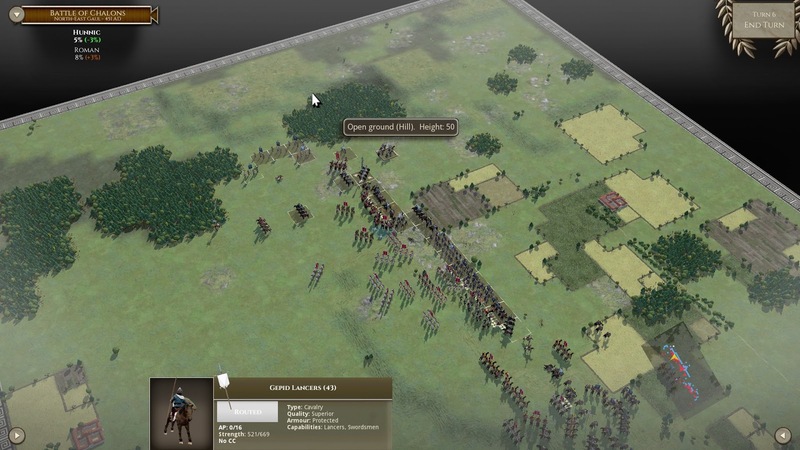 So it is turn eight, and my Hunnish archers have blown a hole through the middle of the Roman/Allied line. 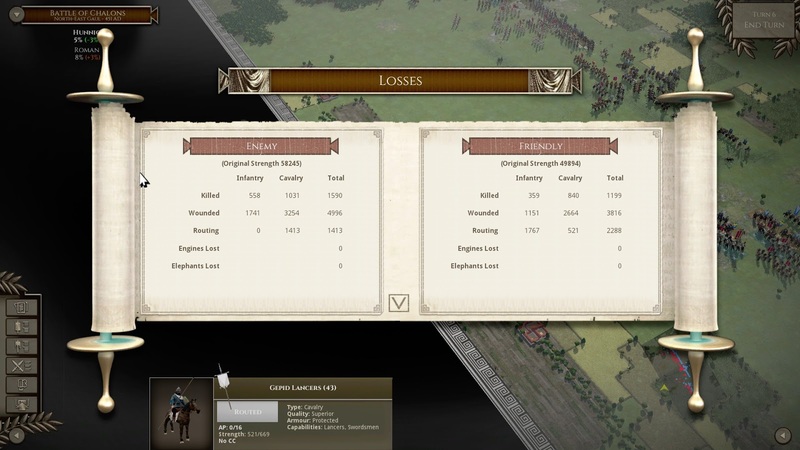 I have lost a lot of troops, but my Huns will now be able to sweep either right or left to destroy either the Romans themselves or the Visigoths. 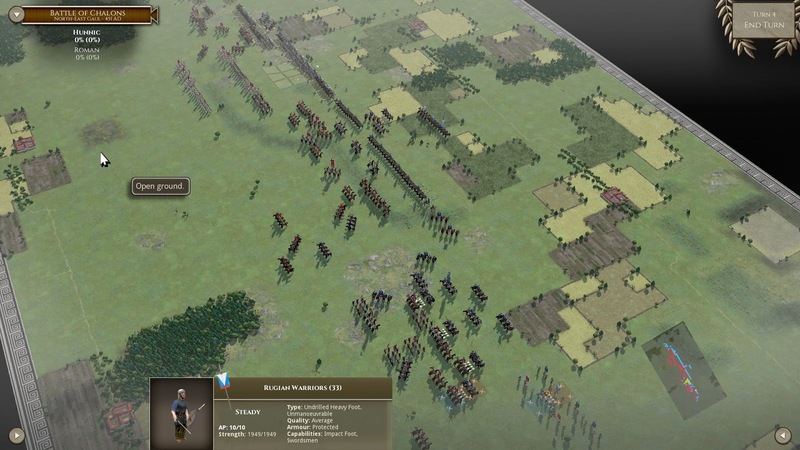 Fighting the battle from Roman side, it will be tough to come up with a strategy to keep the Huns at bay. 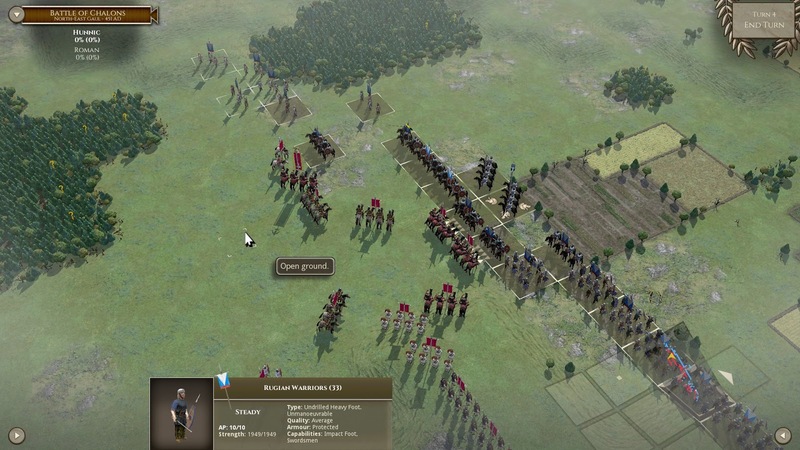 This is an excellent game by Slitherine, and will only get better. This DLC Legions Triumphant is another great add on to the base game. I just wish they had asked me which Epic Battles to include; just kidding.